Get your hands on the best UK promotions from Spin and Win casino! The gaming site has amazing deals in store for you that go hand in hand with exquisite games. The best part is that all players are able to claim something. Extra cash, lots of bonus spins, and hours of fun are waiting for you. The online casino has prepared tailor-made deals for you that can enhance your experience in no time. In order to benefit from a promotion, you must become a member. After that, you should make a qualifying deposit and you’re good to go. Take advantage of the welcome deal and test your luck using the additional funds. Match promotions are perfect if you want to sharpen your skills and you need a boost. Channel your desire for success and enter the rewarding tournaments in order to enjoy some great surprises. 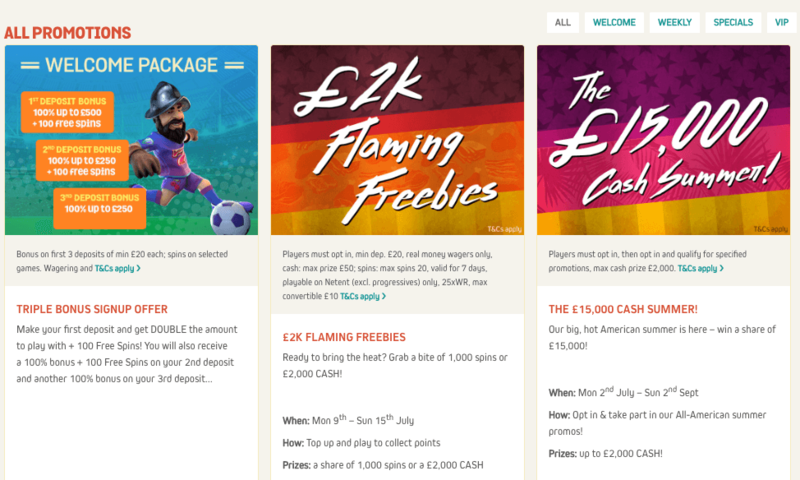 Spin and Win UK takes pride in all its users, so it has prepared some promotions for the VIP players, too. Always keep an eye on promotions because they have an expiration date. For further information about withdrawal limits or wagering requirements, read the Spin and Win bonus rules. In the list below, you will discover amazing bonuses that can surely delight you. Select according to your status and get ready to enjoy your time. Best of luck! Receive your bonus and start the fun. Keep in mind that the extra rounds will be credited for 5 consecutive days, a number of 20 bonus spins per day. They work exclusively on NetEnt slots. The maximum winnings you can make from spins is £10. You can cash out only after you’ve wagered the deposit and bonus amount 30 times and the winnings from the bonus spins 25 times. 3rd deposit: 100% bonus up to £250. Use this bonus money to have the best time of your life. The extra rounds will be credited in 5 batches of 20 every day and they are valid only on NetEnt slots. Deposits made with Neteller are not valid for this offer. Wager your winnings from the spins 25 times and the deposit and bonus amount 30 times. Maximum winnings from the daily spins will be limited to £10. Get your hands on this deal and begin your adventure! What do you say about some extra funds and spins? You can get a 100% match up to £250 plus 100 bonus spins at Spin and Win casino for making your second deposit. Only experienced British gamblers are eligible for this offer. Deposit a minimum of £20 and you will receive your bonus in no time. Neteller is not a valid payment method for this offer. Keep in mind that the bonus spins will be granted to you over 5 consecutive days, 20 spins each day and they can bring you a maximum of £10 in winnings. Wager these winnings 25 times and the deposit and bonus amount 30 times before requesting a withdrawal. Get this bonus and enjoy your time! Spin and Win casino’s existing British gamblers have the chance to grab an awesome reload bonus. Log into your account and make a minimum payment of £20 in order to receive a 100% bonus up to £250. Keep in mind that deposits made with Neteller are not valid for this bonus. Use this extra cash to gamble on all your favourite games. Wager your bonus and deposit amount 30 times before any withdrawals. Take advantage of this offer and enhance your gaming experience! Spin and Win brings you an amazing tournament that comes with many hours of entertainment and special prizes. Until the 2nd of September, you have the chance to obtain some rewards that will surely delight you. You can take part in multiple promotions and challenges until the ending of the tournament. You get one point for depositing at least £20 or for wagering £50 as part of the specified promotions. Do your best to get as many points as possible and be the first on the leaderboard to receive £2000. Cash prizes have no wagering requirements. Participate by clicking the Opt-in button below. Are you a competitive gambler? Spin and Win offers you the chance to join an amazing competition and get a great tournament bonus. Opt-in, deposit over £20 to qualify, and get 1 point for each £20 you deposit and £50 you wager. The more points, you have, the more surprises you can unlock. You can get 1000 bonus spins if you collect 1 to 19 points. If you have more than 100, you can be delighted with £1000. The extra rounds work only on NetEnt slots. The cash has no wagering requirements but the winnings from the bonus spins need to be wagered 25 times prior to any withdrawals. This tournament ends on July 15th. Take part in it and have the best time of your life! Enjoy endless fun at Spin and Win casino! UK players can get 1000 spins or £2000 money out of this tasty treat, so don’t let it go to waste. You can get 1 point for every £20 deposit you make and 1 point for every £50 wagered. To spice things up, the more points you collect, the bigger is the prize. This is the time to show everyone your gambling skills! The spins are playable only on Netent slot machines. Take into account that you have to wager the winnings from them 25 times before making any withdrawals. You can cashout a maximum of £10 from the bonus rounds. Make your strategy, earn points, and enjoy your gambling experience! Grab this amazing bonus from Spin and Win and you enhance your experience! Opt in and deposit over £20 to qualify. You’ll receive 1 coin every time you deposit £20 and every time you wager £50. If you earn enough coins, you can benefit from lots of prizes like bonus spins and cash. Do your best to collect more than 200 coins and you can enjoy a £50 bonus. For 1 to 19 coins collected you get 10 Spins to use on any exclusive slot machine. In order to cash out, you must wager your winnings 25 times. You can’t withdraw from the spins more than £25. As for the bonus cash, the withdrawal limit varies according to the bonus you get but the maximum cash-out is set at £300. Enter this tournament and have tons of fun! £1000 for more than 100 points. Be advised that bonus spins work only on NetEnt slots. You have to wager your winnings from these 25 times for any cash-outs. The cash bonuses come with no wagering requirements. Enter this tournament until the 19th of August and have tons of fun!